Our experts can install or replace a grease trap in your existing system, or we can install an entirely new commercial septic system for your restaurant or office in Tampa, FL. If you have a septic system on your commercial property, you may not know the importance of having a functioning grease trap. This is particularly crucial in restaurants and other commercial buildings that produce food products. When you or your employees drain the sink, this water has small oil particles that become part of the scum layer in the commercial septic tank. Every time you cook something, the grease or oil will typically go down the drain, as well. If this scum layer becomes too thick because of the grease, this can cause a blockage in the pipes, which can ultimately damage the environment. Since restaurants use more oil, there is more in the wastewater, so septic systems in these buildings often back up more often. 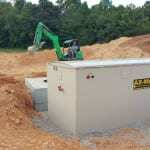 The grease trap is between the sink and septic tank, where it catches and traps grease before it can go into the tank. You can choose from commercial septic grease traps that have higher capacity, which will require less frequent cleaning. Grease traps are usually constructed from durable stainless steel, plastic, concrete, or cast iron, and we can help determine the best type of grease trap for your business. You can prevent clogs and other problems in your septic tank by having our experts clean out your grease trap regularly. Our commercial septic experts at Southern Water & Soil can install or replace a grease trap in your existing system, or we can install an entirely new commercial septic system for your restaurant or office, including low-pressure dosing systems. Our service area includes Tampa, Florida, and many of the surrounding cities. At Southern Water and Soil, we offer commercial septic services in Tampa, Odessa, Lutz, Land O’ Lakes, Brandon, Mooresville, Orlando, Plant City, Dade City, Bartow, Lake Wales, and Lakeland, Florida.